Symphonic Suite No. 2 : And the Medieval Tale Continues / composed by Mark John McEncroe ; orchestrated by Mark J. Saliba. Symphonic Suite No. 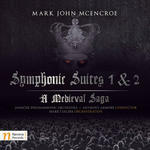 2 "And The Medieval Tale Continues" is the sequel to Symphonic Suite No. 1. The two works are organically connected with a continuous theme. Although set in the middle ages the story draws parallels with the modern day, because human nature seems incapable of change. Greed and self-interest prevail over all else. So we remain chained to similar outcomes irrespective of the age the story unfolds in. Instrumentation: Piccolo, 2 flutes, 2 oboes, 2 clarinets in Bb, 2 bassoons, 4 horns in F, 2 trumpets in B flat, 2 trombones, bass trombone, tuba, timpani, strings. Contents note: 1. The Gathering of Forces: A Call to Arms -- 2. The Night Before The Battle -- 3. The Seige -- 4. A Call for Peace -- 5. Hail To The New King -- 6. A Brave New World. The 6 movements in ‘Symphonic Suite No. 2’ were written over a considerable period of time from 2007 to 2015 for full symphonic orchestra. A note from the composer. ‘Even though the story is set in medieval times, the idea behind this two volume work is that human nature does not seem to change much and as such, the same outcomes seem to keep reoccurring’. Orchestrated by Mark J. Saliba. 20 Oct 16: Ruse, Bulgaria. Featuring Ruse Philharmonic, Nayden Todorov.